In the meantime, we have Human Rights laws (in some places) that we can use in order to gain safe(r) access to neccessities like employment, housing, apartment buildings… facilities (restaurants, shops, hotels and theatres…) and services (health care etc), transit and other public places, so it is a good start, since access is something many of us with MCS/ES do not have now, although equal access is, for now, probably too much of a stretch in this chemical and wireless addicted society. Some (but not all) of the information and resources I present here are from Ontario, Canada, but they can be used to inspire similar actions everywhere. Below is video number two of a training series done by The Ontario Human Rights Commission about the Ontario Human Rights Code and the Accessibility for Ontarians with Disabilities Act, and it specifically mentions environmental sensitivities (which include chemical and electromagnetic/wireless “sensitivities”) as does the 2nd video in the series above. “Disability” covers a broad range and degree of conditions, some visible and some not visible. A disability may have been present from birth, caused by an accident, or developed over time. There are physical, mental and learning disabilities, mental disorders, hearing or vision disabilities, epilepsy, drug and alcohol dependencies, environmental sensitivities, and other conditions. I recently wrote about how the accessibility standards have made a difference for me here and previously wrote about how there is usually little or no safe access for many of us with MCS/ES, because in addition to the chemical barriers, there are many attitudinal barriers to changing the way things are done. REMEMBER: A policy is only good if it is enforced! Something that I believe may be helpful in achieving compliance, is appealing to the self-interest of others. For example, mentioning the recent announcement from the Royal Society of OBGYs advising pregnant women to live as if they have MCS/ES (ok, not in those words, but the advice is essentially the same), and presenting research that shows different types of health harm to the general public and their children from the same substances and materials that disable us. It seems that some other information pages on their website have been replaced. Perhaps, all this will finally make a difference? But it isn’t just indoor spaces, it’s outdoors too. 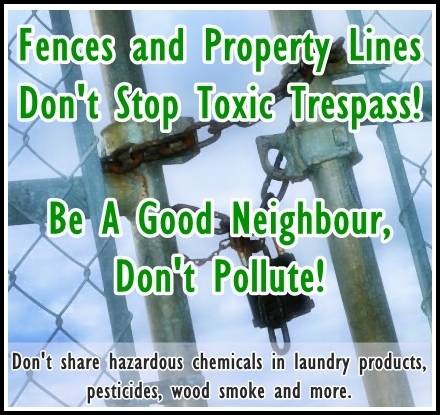 We need to be able to freely and safely sit in our own homes, yards, and balconies without being subjected to the disabling effects of wireless radiation or toxic trespass from neighbors using pesticides, doing laundry with toxic products, burning wood or garbage, along with pollution from other sources and radiation from cell towers or area wi-fi. This entry was posted in Accessibility, Disability, Environmental Sensitivities, Human Rights, Indoor Air Quality, Multiple Chemical Sensitivities, Toxic Trespass and tagged Accessibility in Ontario, Fragrance, Human Rights and Disability, MCS/ES, ontarians with disabilities act, Ontario Human Rights. Bookmark the permalink. Thanks Linda. Only wish enforcement was the norm. It however isn’t so, not even non-smoking by laws which are recognized Globally. Non-enforcement is the same as no accommodation — a reality in Ontario. I wouldn’t be sleeping on the street for over a year if accommodation in shelters and multiple unit dwellings was a reality. It isn’t so I am leaving the country. I am glad you and others are making a difference. Sadly, like I mentioned in another post about accessibility, some people won’t play nice willingly but have to be forced to do so legally. So many of us would be able to work and disability could be prevented and health improvements could be made! I’d leave for warmer, chemically safer climes myself, if I could, but I have no independent source of income and travel isn’t safe for me now either. I like the idea of a guaranteed annual income, which might allow us to head to safer areas, at least occasionally. 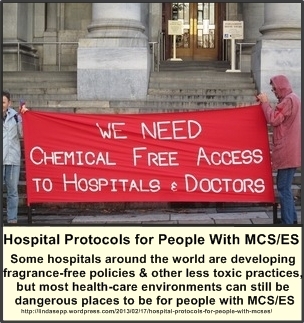 Maybe someday someone will start up MCS/ES airlines, where passengers have to walk through a chemical sensor before boarding and there’s no wireless allowed on board so that those of us with really severe “sensitivities” could travel for therapies and treatment, or to see loved ones during times of need, or even for the rare holiday!!! I hope you are able to meet up with better circumstances, wherever you go!